Molybdenum electrode, as the best electrode, has been used in full electric melting furnace for more than 30 years. 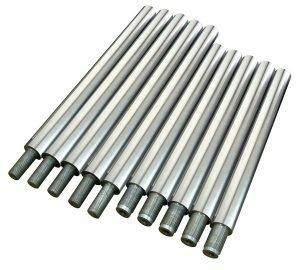 Molybdenum electrode can be divided into molybdenum electrode plate and molybdenum electrode bar according to different shapes and specifications. As a conductive material, the conductive area of the molybdenum electrode plate is larger than that of the molybdenum electrode bar, and the heating is more uniform. Generally, the molybdenum electrode plate will not generate too strong convection, and the erosion of the electrode is less than that of the molybdenum electrode bar. The following points should be noted when using the molybdenum electrode plate. The molybdenum electrode plate must be cold loaded. In order to prevent the oxidation of the molybdenum electrode plate in the process of baking, glass fiber cloth should be used to wrap the electrode. Electrode protection shall be adopted in the feeding channel, and the glass liquid shall be introduced in a short time to completely immerse the electrode, so as to protect the molybdenum electrode plate from oxidation. The mounting structure of the molybdenum electrode plate must be firm to prevent the electrode plate from falling off. Pay attention to the parallel with the bottom of the pool and maintain a good conductive state in the liquid glass. In glass furnace, the performance and efficiency of the molybdenum electrode plate are better than that of the molybdenum electrode bar. However, due to technical limitations, the connection mode of the molybdenum electrode plate was relatively simple in the past. Usually, a hole was drilled in the center of the molybdenum plate, and the power was generated in a spiral shape, then the molybdenum plate and the silver electrode were fixed and screwed tightly with nuts. 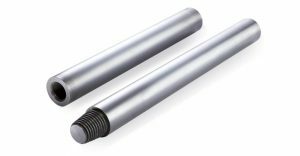 This mounting method will increase the resistance between the electrode and the lead electrode, and it is easy to loosen after a period of use, thus causing a series of damage. If the electrode is serious, it will not be able to be processed and replaced. In the cooling mode of the electrode, water direct cooling is often adopted. The water jacket is easy to leak and it has a short service life. The reasons for damage of molybdenum electrode plate during installation and use may be as follows. The forging pressure ratio of the forging primer bar is not enough, and the grains are not uniform on the section of molybdenum bar. In the molten glass, the intercrystalline surface area and the strength of molybdenum bar decrease as the molybdenum grains grow. The molybdenum alloy plate sank to the bottom of the pool because the molybdenum primer bar broke under the action of its own gravity. The machining of molybdenum plate is too rough, so that the molybdenum bolt and the molybdenum nut tighten too hard during the installation, resulting in damage to the thread root. In order to prevent oxidation of sodium silicate Na2SiO3 (sodium silicate Na2SiO3), the corrosion of Mo metal at high temperature was neglected when the electrode was cold loaded. The electrode is installed too close to the pool brick, which causes erosion of the pool brick. Under the electrochemical action, various components of glass liquid, zirconium corundum, and molybdenum together produce black and brown dirty materials and pollute the glass liquid. Therefore, if we want to extend the service life of the electrode and improve its efficiency, we must improve the performance of the electrode material. Through the preparation of powder metallurgy La2O3-Mo electrode plates, the recrystallization temperature should be above 1200 ℃, and the better mechanical performance also needed. Besides, molybdenum primer electrode and molybdenum screw should be prepared by vacuum smelting method. Compared with molybdenum electrode prepared by powder metallurgy method, molybdenum electrode has higher high-temperature resistance and resistance to silicate and aluminum silicate solution erosion.